La creme brulee is one of the most typical desserts of French gastronomy. Today we will learn how to prepare it with this simple recipe. 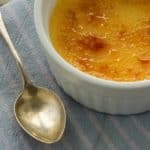 Crème brûlée means, literally, "crema burned". The idea of ​​this dessert is to achieve a very creamy base, and give crispy touch with a solid caramel cover, but delicate enough to split with a spoon hit, or just a bit of pressure. The main ingredients are eggs, cream and sugar. You can also optionally add cinnamon and/or vanilla essence. I recommend it. Learn how to prepare this typical dessert of French cuisine, with this recipe explained step by step.We will set it to 160 degrees centigrade. Then, there are separate whites and yolks of the eggs. We will keep the whites for some other recipe. In the case of the yolks, the we will beat with the sugar, until obtaining a homogeneous mixture. We will also add the vanilla, if we have decided to use it, to aromatize this mixture. We will beat more the set, to incorporate it perfectly to the cream. We will reserve the mixture of eggs and sugar, momentarily, to take care of the cream of milk. To continue, we will heat a pot and add the latter. Inside, we will put the cinnamon stick. The objective will be to bring the cream of milk about to boil. However, it is important that we do this operation with care to prevent the cream from burning. From the start, you have to keep the fire between medium and low. Once Let the milk cream boil, remove it from the heat and remove the cinnamon. Next, we will add the pasta that we have previously prepared with the eggs and sugar, while we are stirring everything very well. Once obtained a homogeneous cream, we will distribute our mixture in molds suitable for the oven. We can use the typical wide and low containers to prepare crème brûlée, or else, any individual ceramic container that can be baked and boiled. What follows is to prepare a container with water to take our creams in a bain-marie in the oven, for half an hour. Once we take them out, we'll let them cool down. It is important not to skip this step, because the sudden changes of temperature can damage the milk contained in this recipe. Then, we will proceed to work the sugar cover. Sprinkle with a couple of tablespoons of sugar the surface of each mold, to make an even capita. With a torch, we will pass each layer to the fire so that it melts, and we will obtain our candy covers. Once the candy has been" burned ", we will store our creme brulee in the refrigerator. 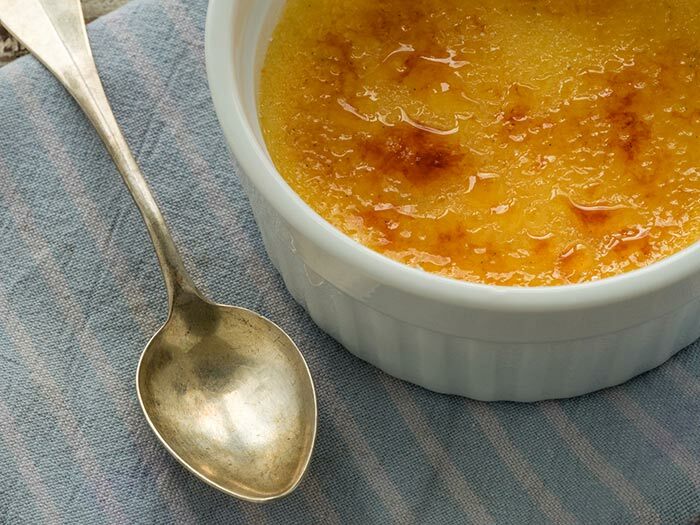 Some people extend the cooking time to obtain a more golden crème brûlée. In this case, you can leave the bain-marie up to an hour and a half in the oven, but make sure to lower the cooking temperature considerably, to 100 degrees. As it is most likely that we do not have a blowtorch in house to "burn" the candy, we can try two alternatives. One is to preheat the oven to the maximum and brown our crème brulees for a couple of minutes. Another is to make the caramel melting the sugar in a pot, and make each layer by letting it fall little by little on the surface of each cream. We may have to return the pot to the fire a couple of times to recover the almost liquid point of the sugar.You can also add a discrete splash of some liquor, or boil the cream of milk with lemon or orange peels. You can use muscabada, morena or rubia sugar, for the burnt caramel. This with the aim of obtaining a more golden and dark color. For a more intense vanilla flavor, instead of a spoonful of essence, you can use a pod of this ingredient, remove the beans and add them to the milk. If you want to balance the sweet flavor of this dessert, you can add a pinch of salt to the preparation. If you like the idea of ​​preparing other French recipes, we propose our recipe of onion soup, our recipe of traditional quiche lorraine, or an easy recipe for crepes. If you prefer the preparation of creamy desserts, you can try our recipe for custard cream. I also recommend the flan recipe. This site is in no way affiliated with or endorsed by Land & Sea Fish & Lobster Corporation. It exists as a compendium of supporting information intended for informational purposes only.